New Relic has helped many organizations modernize their software stack by giving them the visibility, insights, and confidence needed to move their applications to the cloud. Our powerful, real-time, and iterative analytics provide 360-degree visibility into on-premise and cloud-based applications, with perspectives on infrastructure, application, end-user experience (synthetic and real), and business success. 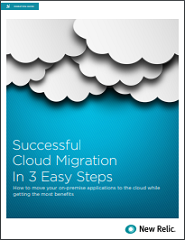 To ensure a successful migration, it’s important to stay focused on customer experience and user satisfaction. No matter what the underlying infrastructure, cloud or otherwise, you are responsible for your applications’ performance.